Purchase 50 or more Basic Casualty Simulation Kits and download your free support pack worth £100. Purchase 200 or more Basic Casualty Simulation Kits and you can have personalised covers absolutely free! 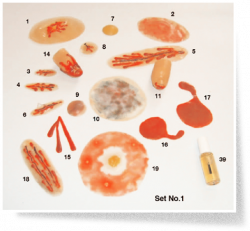 A Casualty simulation kit for demonstrating procedures to deal with various wounds. Spirit gum (for attaching above).